In the United States a beef is divided into 8 initial sections called primal cuts. These are: Brisket, Chuck, Flank, Loin, Plate, Rib, Round, Shank. These basic sections are then subdivided into the subprimal or food service cuts: steaks, roasts, ground beef, etc. The Chuck is in the shoulder area. It comprises about 26% of the yield from one beef. The muscles in this area are used for walking. Active muscles contain higher amounts of collagen than those used less frequently. It is the collagen that makes these cuts less tender. Slow, moist cooking methods like stewing and braising are the best ways to prepare these roasts and stew meat. Collagen is soluble in water so when it is cooked slowly with moist heat it turns to gelatin. The cuts we offer from this section include the marrow bone arm roast, the 7-bone chuck roast, stew meat, and ground beef. The Round is in the rump area. It comprises about 23% of the yield from one beef. The muscles in this area get similar use as the Chuck so tend to be less tender. Again, slow, moist cooking will break down the collagen for more tender eating. 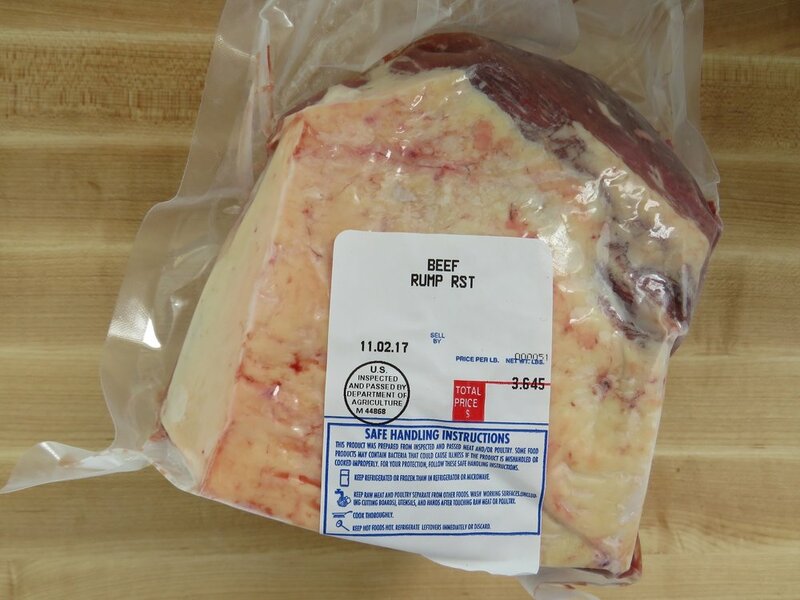 The cuts we offer from this section include the rump roast, stew meat, and ground beef. The Loin is in front of The Round, behind The Rib. It comprises about 17% of the yield from one beef. It includes the subsections Short Loin, Sirloin, Tenderloin, Top and Bottom Sirloins. This area gets very little muscle action so the meat is more tender. These meats may be roasted or grilled and are best when cooked rare to medium. The cuts we offer from this section include the New York steak, tenderloin, sirloin steak, sirloin tip roast, and tri-tip. The Rib is in front of The Loin, behind The Chuck. In comprises about 9% of the yield from one beef. This upper rib cage area is very lightly worked, hence the meat is very tender. The cuts we offer from this section include the boneless Rib-Eye steak and the Prime Rib roast. The Plate is the abdominal area just behind the front legs. It comprises about 9% of the yield from one beef. This area has coarse muscle fibers so is less tender. This is the area that contains short ribs and skirt steaks but we grind this section into our ground beef. The Flank is the lower abdominal area behind The Plate, in front of the back legs. It comprises about 5% of the yield from one beef. This area is lean and has strong muscle fibers from exercise. For serving, it is best to cut across the grain of these fibers. The cut we offer from this area is the flank steak. The Brisket is the area below The Chuck and above the front legs. It comprises about 4% of the yield from one beef. 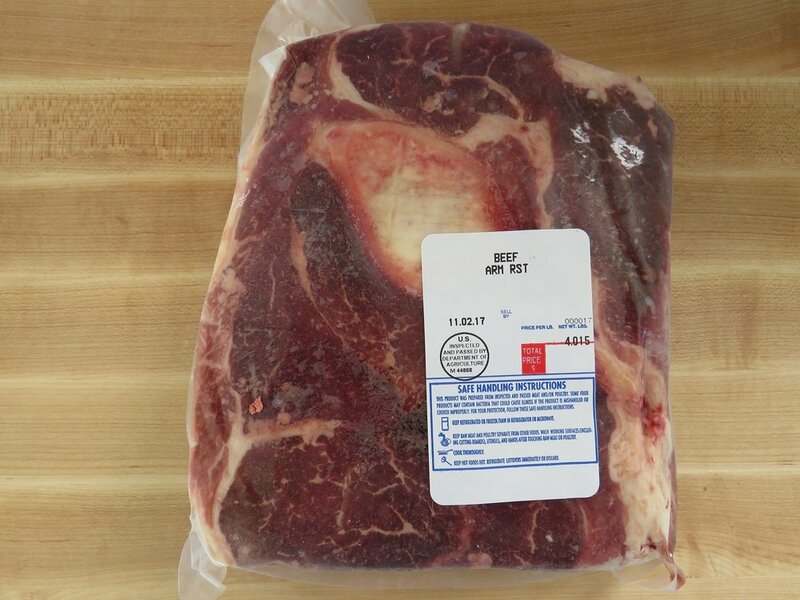 The Brisket includes the pectoral muscles that are responsible for supporting much of the animal’s weight. Although these are tough, working connective tissues, they also include a generous amount of fat to add flavor. Long, slow cooking will break down the tough connective tissues. We offer the brisket in two parts, the flat and the point. The flat tends to be more lean than the point. The Shank is the leg. It includes the leg marrow bone. It comprises about 3% of the yield from one beef. The cut we offer from this area are the sliced shanks, 1” cross sections of the leg. They include the marrow bone and a good portion of meat and some fat. They make excellent soup stock and the meat is flavorful. 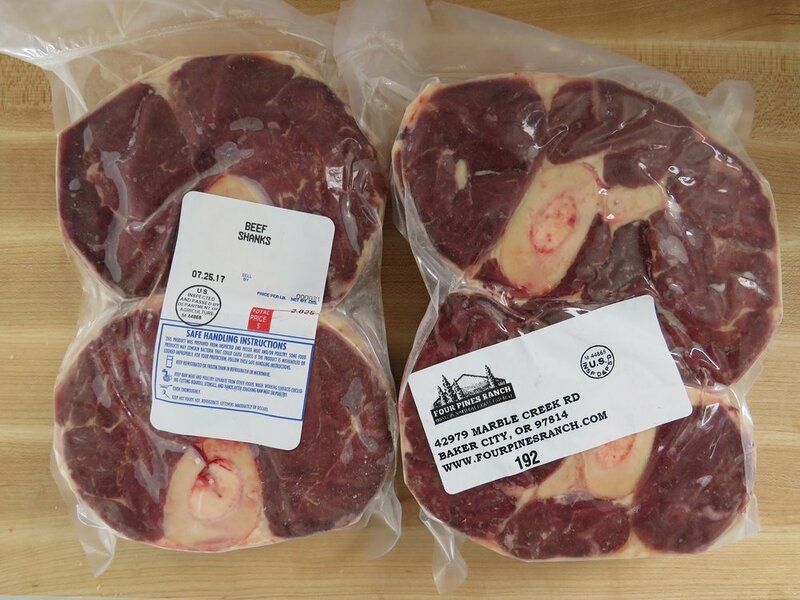 Sometimes these are referred to as osso bucco style cuts. Osso bucco originally was a term applied to veal. The words are Italian for bone with a hole, the marrow bone.